Building strong forearms increases your grip strength too. Eight muscles in your forearm are responsible for both extending and stabilizing your wrist. The extensors work in concert with your forearm muscles that flex your wrist. 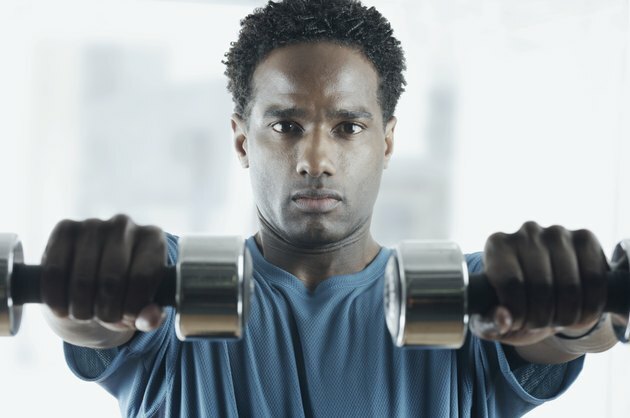 If you’re just starting out or exercising for general fitness, using free weights gives your forearm extensors enough of a workout. But if you’re bodybuilding and want to build bigger forearms, you need to know how to work them against resistance, just like any other muscle. You can do wrist extensions with a barbell, dumbbells or a low cable pulley located just in front of your feet. It’s easiest to do this exercise while sitting, with your forearms resting on your thighs. Grasp the barbell -- or pulley handle or dumbbells -- in both hands, palms facing down. Let your hands hang forward over your knees. Extend your wrists, bringing your knuckles as close to your chin as possible without lifting your forearms. Repeat. Reverse curls work your extensors in an isometric contraction. In other words, your forearm extensors work to hold your wrist stationary against the weight’s resistance instead of actively flexing your arm at the wrist. Grasp a dumbbell in each hand, palms facing your body, arms extended down in front of you. Bend your arms, curling your forearms up toward your shoulders. Lower and repeat. You can also do this exercise with a barbell or standing over a low cable pulley. The wrist roller relieves the monotony of performing wrist extensions and lets you work all the muscles of your forearms as a unit. Some gyms have a wrist roller machine, but you’ll more frequently see the free-weight version -- short bar with a rope that wraps around it and a weight plate affixed at the end of the rope. Hold the wrist roller in both hands with the weight plate dangling just above the floor. The rope on the wrist roller should drape over the bar, pointing away from you. Use one hand at a time to rotate the bar toward you until the weight plate reaches the bar; then reverse the motion to lower the weight. Repeat.